My husband and I are die-hard snoozers. We are guilty of carelessly hitting the snooze button time and time again just to catch those extra nine minute intervals of doze time. (And a nine minute snooze? Don't even get me started on that). It's stupid really. But it means that we're often running out the door; beginning our days without breakfast in our bellies. So I was quite excited to happen upon a recipe for breakfast bars. They are not exactly the most nutritious breakfast as, though they have fruit and oats, they are no stranger to sugar. I suppose you could cut down on the brown sugar and substitute organic honey, but heck, they just wouldn't be the same. They are not only delicious with a dollop of healthy yogurt, but were a welcome addition to our throw-'em-in-your-bag-and-out-the-door-you-go-breakfast of banana muffins routine. They're, as I have come to affectionately describe them, a cross between a crumble and a fruity sandwich cookie. Then the fruit middle and 'crumble' topping. Easy enough to whip together before making dinner and yummy to boot. The original recipe called for raspberries, but as I had heaps of blueberries in my freezer, I made the simple substitution. I'm confident that any berry or reasonable fruit substitution could be made and the recipe would hold up (and by reasonable I mean the obvious no-no's like watermelon). Make the crust and crumb: Preheat oven to 350°F. Put a long piece of parchment paper in the bottom of a 9x13 glass or light-colored baking pan the pan, letting the parchment extend up the sides and end a bit. (This will make it easy to remove the bars from the pan after they have baked). Butter the parchment. 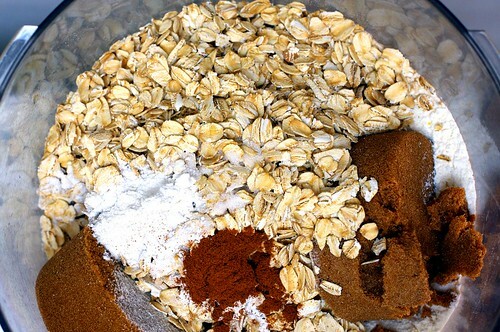 Put the flour, brown sugar, oats, salt, baking powder, baking soda, and cinnamon in a food processor. Pulse in short bursts until combined. Add the butter and pulse until loose crumbs form. (As a lazy side note, if butter is melted and mixed with dry ingredients, a nice crumb can also be formed). *Reserve 1 1/2 cups of the mixture and set aside. Pour the rest of the mixture into the prepared pan and push crust into an even layer. Crust should touch the sides of the pan. Bake until golden brown, 12-15 minutes. Transfer to wire rack and let cool. Keep oven on. Make filling: in a bowl, whisk sugar, lemon zest, cinnamon, and flour together. Add fruit, lemon juice, and butter. 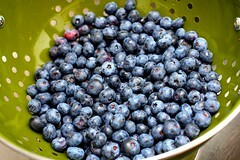 Toss gently until fruit is evenly coated. Assemble and Bake: spread filling evenly on top of the cooled crust. Sprinkle the reserved crust mixture evenly on top of the filling. Bake for 35-45 minutes, rotating the pan once or twice, until the top is golden brown and the filling starts to bubble around the edges. Transfer to wire rack and let cool. Cut into squares and serve. 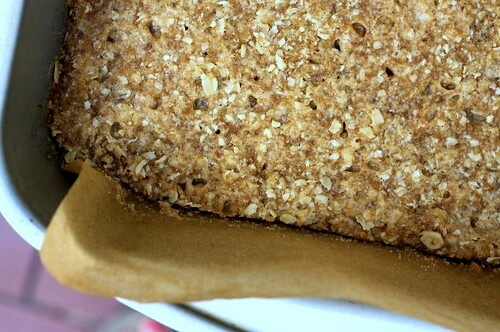 I wrapped the bars in parchment and chucked them in the freezer with our other quick breakfasts. They're particularly yummy, and actually quite reminiscent of dessert crumble; I kind of feel like a kid sneaking a treat when I eat these for breakfast.